The Forever Free IPL hair remover is an at-home IPL hair removal system. It uses intense pulsed light IPL technology to give long term hair reduction. Permanent hair reduction is achieved with regular treatments. Home IPL is suitable for larger areas such as legs, arms, underarms, bikini line, back and chest as well as certain areas of the face. 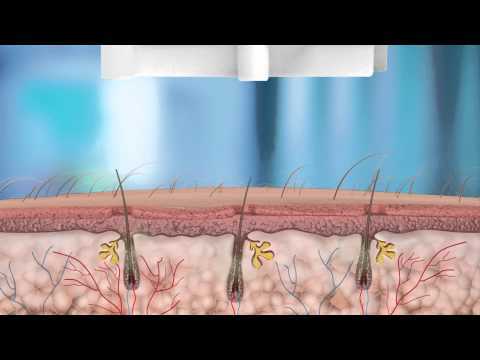 Placed against the skin, gentle pulses of intense light are directed at the hair follicle to disable the hair root without affecting the surrounding area. Step 1: Shave the area to be treated. This ensures that the light energy goes directly to the hair root and avoids hair burning on the surface. Step 2: Connect mains power lead into the power socket on the back of the unit and plug into the mains. Step 3: Turn the key clockwise to the on position to unlock. The light around the key switch will flash green. Power level 1 will illuminate and the fan will startup. Step 4: Enter the security code by pressing the buttons (highlighted in black) in the following order: The unit will emit 2 beeps and the keys witch will stop flashing and illuminate green. A series of self-checks will be performed. During this time, the power levels will illuminate up and down. When completed, the lowest power level will illuminate and the enable button will flash blue ready for selection. Step 5: Press the enable button once.The enable button will stop flashing.The orange lights on the wand will illuminate. Note: Each time the power setting is adjusted, you will need to press the enable button to continue. Step 6: Place the wand over the area you wishto treat. Ensure all 4 skin sensors are incontact with the skin (you may need toapply gentle pressure). The blue ‘ready’lights will illuminate. Step 7: Press and hold the treatment buttonon the wand. This initiates the treatment flash. You may feel a slight warming of the area. Step 8: The blue lights will go out after thetreatment flash. The unit will also selfcheckafter each flash. This takes fiveseconds, during this time the power level lights will illuminate up and down.When moving the wand to the nextarea, the skin sensors must be lifted off the skin.If you are increasing power for the nexttreatment, press the ( ) button andreturn to step 5.Important: Do not exceed themaximum power level for your skin type.